Sister Society in Bali — Dr. Kristian H.
You'll bask in the incredible island culture on the ultimate Balinese escape. 6 nights in a boutique hotel, set within the lush tropical rainforest. Photos for days. That's right, each morning, you'll receive images of you soaking in the Balinese experience. By the end of the trip, you'll rack up at least 1,000 photos of pure island bliss. Connect with 7 of the most influential millennial Black women who are creating brands, inspiring the next generation, and leading change. Travel like a Balinese local. Immerse yourself in an exotic experience. Every day you’ll eat local, crisp Balinese fruits and savor fresh vegetables and seafood or meat. We’ll also be walking daily, surrounded by nature and we will offer daily yoga and meditation classes to help you reconnect with your inner-self. We have hand selected influential like-minded Black Women to invite on this experience. We have created the experience and we know that you will make the #BlackGirlMagic happen. Ubud is an unparalleled oasis of tranquility and a lovely break from the humdrum of everyday life. 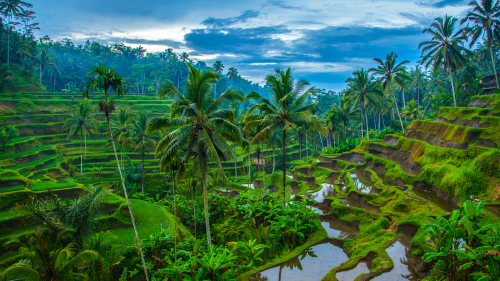 Steeped in culture and enhanced by magnificent vistas, a trip to Ubud will change your life. Just take a walk through the lush paddy fields or walk through the remains of the old kingdom, and you’ll see what effect this place can have on your soul. Each morning we will over sunrise yoga. Upon landing at the Ngurah Rai International Airport, we’ll pick you up in our shuttle and whisk you away to your gorgeous temporary home for the week, located in the heart of Ubud. While living here, you’ll wake up daily to the scenic views of rice fields and nearby coconut groves. Take the rest of the day to unpack, explore the hotel, and get comfortable. In the evening, we’ll all join together for a welcome dinner. Enjoy a fresh and light breakfast at our peaceful hotel. Then we’ll head out to the village of Laplapan to meet with a local family. We’ll head to the local Ubud market to select from fresh vegetables, local herbs and spices, and choice cuts of meat. We’ll take our market finds to a local village kitchen where we’ll learn to cook a traditional Balinese lunch. If you signed up for a massage, your masseuse will meet you in the afternoon for an hour of rejuvenation. You'll have the evening free to explore on your own. Today, you’re in for a real adventure! After a tasty breakfast at our hotel, we’ll head to one of the region’s most beautiful beaches for a surfing lesson! Even if you never stand on a wave, you’ll still have the incredible experience of riding a surfboard in the Balinese waters, surrounded by sweeping vistas of mountains and crystal blue seas. After some time to have lunch and relax on the, we’ll gather back as a group and enjoy dinner together. This gorgeous town was practically built for R&R. Today, experience Bali as you please. Take a book to one of the local beaches, or enjoy a glass of wine while taking in the spectacular views, or wander around the city. The day is yours. Today we’re visiting a beautiful natural dye plant garden to learn all about Indonesia’s textile traditions. After learning about the plants used by traditional weavers across Indonesia to make natural dyes for cotton, silk and other fibers, you’ll get a chance to make your own naturally dyed batik fabric to take home! In the evening, we’ll join a very special guest for dinner in his one of a kind Balinese home. On our last full day together, we’ll be visiting a local village to explore Balinese culture through its history. We’ll have the opportunity to speak with the villagers about their daily life over lunch and learn from them what makes Bali so special — from its temples to its music. At night, we’ll gather together for a special farewell dinner. If you’d like, you can wake up early for an optional self-guided hike or a visit to your favorite market one last time. After breakfast our shuttle will depart for the Ngurah Rai International Airport. You’ll never forget the memories you made this week in Bali. 6 nights at an outstanding hotel. Day trips, guides and transportation to Seminyak. All breakfasts, 3 lunches, 4 dinners (alcohol not included). Your investment does not include your flight to Bali.